Your home is more than four walls and a roof; it’s you and your family’s safe haven. For most, a home is a castle. For others, it’s an oasis to escape a hard day. But what happens when your home is broken into, burglarized, and left in ruin? No longer do you feel safe simply locking the windows and doors before bed. That’s why it’s imperative you take action before a property crime occurs at your place of residence. As the premiere locksmith company serving Paramus, Firstline strongly urges you to give us a call. We want you and your family to feel safe behind secure window and door locks that deter criminal activity, not welcome it. In this post, we’ll share some general advice on how to shore up your home. Did you know that one in 23 properties will face a property crime in Paramus? When you increase the security measures of your home, you reduce your chance of facing criminal activity. 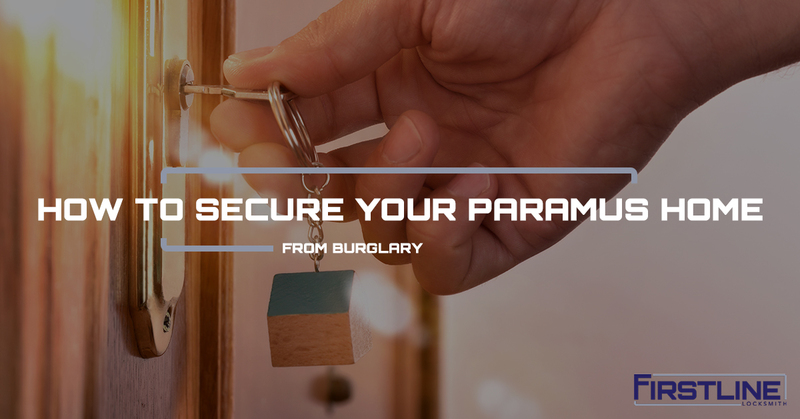 Even if a criminal targets your home, the upgraded locks, security system, and more will deter them after their initial attempt. Want to learn more? Keep reading! You’ll want to start with your exterior doors. Upgrade the doors to a solid core or metal door. This reinforces door strength and virtually eliminates the ability to break through a door as opposed to picking the lock. Next, upgrade your deadbolt and lock-in-knob sets. A high-security, heavy-duty deadbolt and lock-in-knob will further increase the security of your exterior entrances. Finally, install a wide-angle peephole on all exterior doors. This allows you more sight in the event that you need to see outside without opening the door. Most homeowners aren’t aware that their windows are a weak point when it comes to home security. The glass is relatively easily broken, although noisy. Depending on where the window is located, it can be easily accessible and hidden from the street or neighbors. The best way to secure windows are to add blocking devices, reduce opening range, upgrade locks, and install burglar-proof glass. Alarms and alerts help deter criminals and warn you of criminal activity at your home. Furthermore, cameras and motion-sensor lighting offers the opportunity to capture the criminal on video. Hopefully, the police are able to identify them and bring them to justice. Ultimately, you want to do everything you can to protect your family and your home. Your local locksmith in Paramus is dedicated to your home security and family safety. At Firstline, we offer a wide variety of locksmith services. After 25-plus years serving New Jersey and its great cities, we know what it takes to secure a home with expert security and lock services. It’s time you secure your home. Call us today!